Ideal to use when building vocabulary in the classroom. Children refer to the list of words when writing and choosing alternative words for ‘nice’. Print, cut and laminate the poster and word cards. Display the poster and word cards in the classroom. 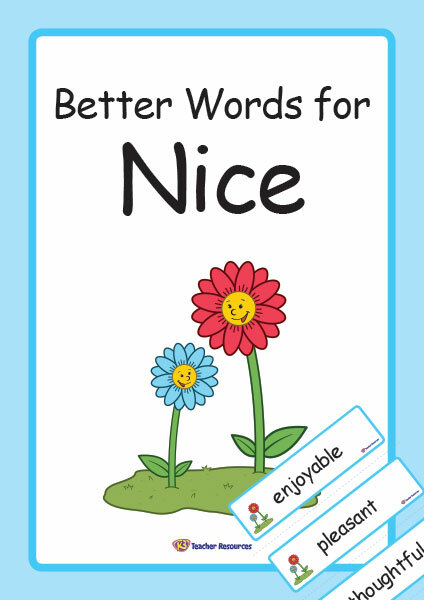 Encourage the children to refer to the list of words when writing the word ‘nice’. What comes next? – Use the blank cards to come up with more better words for nice as a class. Great idea. Easy to read and clearly set out for classroom display. Thank you.